Sweet children, make your nature very sweet and peaceful. Let your words and behaviour be such that everyone says: This one is like a deity. Which certificate do you children need to claim from the Father at the confluence age? The certificate of divine manners. The Father is decorating and serving you children so much and so you surely have to give the return of that. You have to become the Father's helpers. The children who help Him are those whose nature is divine and who never become tired of Godly service. They love serving the yagya. The Father rewards such children. And offers them hospitality. The Father is pleased to see such serviceable and loving children. The heart desires to call out to You. Before the fortune is created, the heart calls out to You! know that God sits here and explains songs of knowledge to you and makes you dance the dance of knowledge. OK, what will happen through this? It is said: You remain as constantly happy and cheerful as the deities. God alone is called the unlimited Father and the Creator of the world. He is the Creator of heaven. The world is at first heaven. It then later becomes hell. So, it is now hell. People continue to stumble around on the path of devotion. Devotees remember God. Souls believe that the Father will bring the gift of heaven for them. He alone is the Creator. He comes and teaches us Raja Yoga to make us into the masters of heaven. He says: Remember the Father and the state of being a master of the world. When the Creator of the world enters your intellect, it is understood that the Supreme Father, the Supreme Soul, creates a new world. This world is the place where human beings reside. The Father is the Master of the Unlimited and so He would definitely create a large unlimited world. He would not build a small home for you. Physical fathers continue to build those. This One creates a new world. The world is the home for you children, that is, it is the place where you play your parts. You know that you are residents of Bharat and so you belong to this home. People of Bharat consider themselves to be the masters of the limited world. 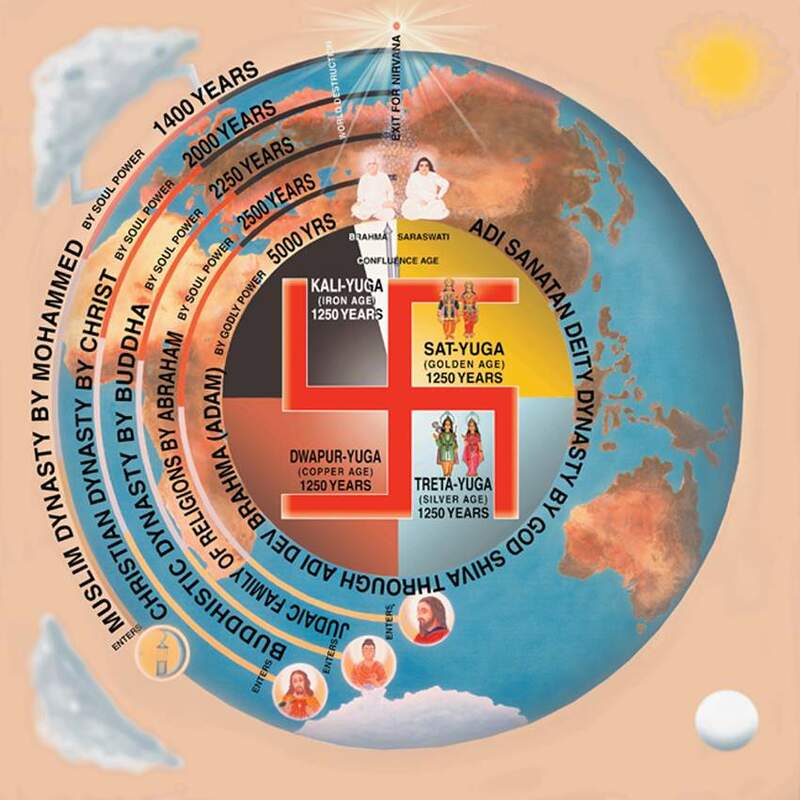 However, the people of Bharat were residents of the unlimited world. The Father explains to you very well, but you children repeatedly forget this. You don't even thank Him. The unlimited Father comes and creates the unlimited world, the home that is heaven for you. It isn't that the Father is the One who creates unlimited hell. The Father comes and creates heaven and He makes you children into the masters of that heaven. This means that He makes you into the masters of the new world. The masters of that world, Lakshmi and Narayan, existed in Bharat. At that time, there were no other religions; there was just Bharat. The Father explains to you so well, but you children don't become that intoxicated. Children remain in their limited intoxication. The soul has that intoxication. When a soul’s body grows larger, he is able to say everything through his organs. A small child wouldn’t say: I am a master of the world, or I am so-and-so. When he reaches adolescence, he understands that he is a master. You are no longer small; you have grown up. The Father too has taken an old body. You understand that the Father is the Creator of the world. He Himself doesn't become the Master. Sometimes, there are mistakes made in using some of these words. The Father is the Creator of the world. He says: I do not rule the world. I alone am the Creator of the whole world. You have to refine every word when you explain. The Father, the Creator of the World, is explaining to you directly. I have come to make you into the masters of the world. It is not that I have come to make you into the masters of Bharat alone. Those who are the masters of Bharat at this time do not have that happiness. Everyone is now to be buried in the graveyard. This is called the time of settlement. The Creator of the world would definitely be God. He alone is the Creator of the new world. The new world is called heaven and the old world is called hell. You children also understand, numberwise. Those who have less knowledge don't have that much happiness; Maya doesn't allow them to remain happy. Some children don't become soul conscious. When you become body conscious, all the vices come to oppose you. You children know that that One is the Father of us souls. All the devotees call out to Him: Come and tell us something. It is written: God speaks. I have come to make you into the masters of heaven. I make you worthy. I tell you the history and geography of the whole world. Who are the main actors in this unlimited drama? Your intellects go into the unlimited. The incorporeal world, the subtle region and the corporeal world are all included in the drama. There are also some among you who understand these things very well. Some are unable to imbibe anything because they have been like Ajamil (a great sinner) for many births. They have those sanskars. They are like such a hot griddle that they are unable to imbibe anything at all. They too are uplifted. At least they go to heaven; they become maids or servants, they become subjects. To uplift them means that at least He sends them to heaven. However, the status they receive is according to the efforts they have made. If they don't imbibe they will go to heaven, but they will receive the status of a maid or a servant. No matter how much is explained to some children, it is like pouring water on to a hot griddle. So it is understood that they have those sanskars. Sannyasis also carry their sanskars. When they take another birth they then have the thought of adopting renunciation again. These things are explained here. In the golden age, there is no question of vice. There, they have the sanskars of remaining viceless for birth after birth. Even Maya doesn't exist there. Here, so much effort is made to reform the children. Some are like filthy clothes: when they are beaten with a laundry stick, even a little, they completely tear apart. Laundrymen take care of clothes, but if some clothes are rotten and worn out, they quickly tear apart. In that case, they become those who were amazed and who then ran away. The Father makes so much effort. He is teaching us Raja Yoga. He alone is the Merciful One who has mercy for everyone. Baba is merciful whereas Maya is merciless. Maya has totally destroyed everything (all truth) and this is why Baba says: I come every cycle, at the confluence age of the cycle. The Father is the Purifier. He has to come here to take the impure ones back home. There are no impure beings in the silver age that I would come in the silver age and make them pure. God is the Truth. He alone speaks the truth. You children now know that Shiv Baba, the Creator of the world, truly inspires you through Brahma to make effort so that you become the masters of the world. The Father says: If you make My efforts go to waste, if you deceive many others with your behaviour, your status will be destroyed. It would be said: The evil spirit has not yet departed from that one. The behaviour of you children should be such that everyone thinks: This one is a like a deity. Deities are very well known. It is said: This one's nature is totally divine. It is then understood that the nature of all the rest is devilish. Some children have very first-class, divine virtues. They are absolutely sweet and have peaceful natures. Therefore, the Father is pleased to see such children. You children understand that the Father is having a home built for you, and so you also have to serve. Such children climb onto the heart a great deal. Those who do something without being told are deities, those who have to be told are human beings and those who don't do something, even when asked, are even worse than human beings. Baba says: Children, if you don't stay in yoga, you will be totally finished in the mud of Maya. Baba tells you again and again: Continue to follow shrimat! Never perform devilish acts. Let your speaking and interaction be very sweet. Deities have such sweet natures. They used to rule in Bharat. As are the king and queen, so the subjects, too, have divine natures. The Father comes to make you into the masters of heaven and so you should be so helpful to such a Father. You should busy yourself in service by yourself. Don't think: I am tired, or I don't have time. There is benefit in doing everything on time. Shiv Baba gives the reward of the yagya service you do. This Baba would give you special regard and win your heart, but that Baba is the One who claims your heart wholeheartedly. This one (Brahma Baba) wins your heart in a limited way. When He sees the divine activity of some children, Baba surrenders Himself to such children. Children who remain busy in service, even without being asked, are said to be like deities. Deities don't need to be told anything. There, they don't have devilish natures. Here, many children don't follow the directions of the mother and Father and so they cause themselves a loss. The Father says: I come from the supreme abode to serve you children. By not following My directions, you cause sorrow to so many. The same thing happened in the previous cycle too. While drinking nectar, you become impure. There is a story: Even when Lakshmi gave them nectar to drink, they became devils. Therefore, never even try to cause anyone sorrow. Otherwise you will lose your fortune of the whole kingdom and become those worthy of being beaten with a stick. Baba has explained: I am Dharamraj. When anything was done indirectly, you used to experience temporary punishment for that. Now, after belonging to the Father directly, if you make Baba's efforts go to waste, there would have to be great punishment. I am making you into deities and Maya then comes and makes you into devils. The Father repeatedly tells you to imbibe divine virtues. It is remembered that even animals used to love one another in the kingdom of Rama. They would drink water together from the same pool. Here, they drink nectar, then they become devils and then traitors. They then cause difficulties for the decoration of the Brahmin clan. They would be in such degradation! The Father comes to grant you salvation, and so you children have to become those with divine virtues. You have to serve by yourself. The Father will also give you a certificate. Those who have good faith in their intellects will constantly remember the Father. They are always concerned not to defame the Father's name. They do not show any devilish traits. Now, all of you are numberwise effort-makers. You should simply have the faith that you are Godfatherly students. God speaks to the children: I teach you and make you into the kings of kings. I teach you knowledge and yoga. Become soul conscious. I have come to take you back. You souls will follow Me like a swarm of mosquitoes. Truly, there was the Mahabharat War. So they followed the Guide like mosquitoes. Baba is the Guide. He says: I have come to liberate you. You are very unhappy in the web of Maya. Firstly, you go into the jail of a womb and, secondly, it has become very easy for human beings to go to that jail. They go to jail in great happiness. Seeing one another, they even begin to go on hunger strike etc. Look at the things they do to cause their souls sorrow. That is called suicide of the soul. When the body is healthy, the soul says: I am happy. When the body is not healthy, the soul says: I am unhappy. The Father comes to make you into the constantly happy masters of heaven. The Master of the World says: I am the Creator of the new world and that is why I am called the Master. However, I do not rule there. All devotees worship Me. They say: O God, come and liberate us from the sorrow of the iron age. Send us to the land of nirvana, or, send us to the land of heaven. The Father first sends you to the land of happiness and then Maya changes that into the land of sorrow. This cycle turns in this way. The Father says: Children, now stop being careless. Maya makes you perform many wrong actions through which your status is destroyed. After knowing and recognising the Father and following His directions, you will be able to become elevated. Otherwise, there will be a lot of punishment. Just as God's praise is limitless, in the same way, the misfortune of experiencing punishment is also limitless. It is now the time of settlement. Everyone settles their karmic accounts. Those who experience punishment will not come into this rosary. The Father says: Simply remember that God, the Father, the Creator of the World, the knowledge-full One, is teaching us. He would definitely give you your inheritance to become the masters of the world. Even if you just remember this much, you will continue to laugh and play. Achcha. 1. Let your words and behaviour be very sweet. Don't perform any devilish acts. Imbibe divine manners. 2. Become a helper in the Father's service without being asked. Definitely give a return for the Father's efforts. Don't be careless. May you be free from all jamelas (circus chaos) and experience the reward of fullness through your perfection. At the confluence age, the Ocean is not separate from the Ganges and the Ganges is not separate from the Ocean. At this time, the mela takes place of the river merging into the ocean. Those who stay in this mela become free from all jamelas. However, only those who become equal can experience this mela. To become equal means to become merged. Those who are constantly merged in love experience the reward of fullness and perfection. They do not have any desires for temporary rewards. Constantly stay in the elevated company of the one Father and you will become the holiest and the highest.